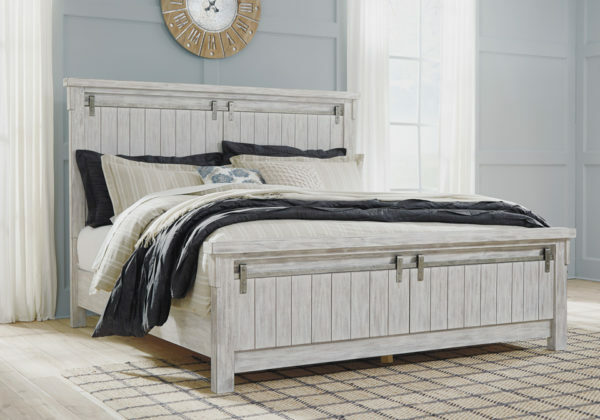 The Brashland king panel bed brings a fresh twist to the modern farmhouse movement. Handsome, hearty profile of this high headboard bed is made all the more interesting with planked faux barn door panels with metal hardware. Through-tenon styling incorporates a welcome touch of American craftsman style. And the easy on the eyes, distressed white finish? Just the tone for a soothing, serene bedroom retreat. Mattress and foundation/box spring available, sold separately. *The price does not include mattress, boxsprings or bed linens. *The image shown is a queen size bed. *Nightstand sold separately. Made with Acacia veneers and select hardwood solids and finished in a white textured rub-through finish. Modern craftsman touches with the thru-tenon look throughout and generous scaling of the cases and pilasters. Panel bed features planked faux barn door panels with accenting metal hardware. Cases feature framed and planked tops with raised center panel. Night stand features an AC power supply with (2) USB charging ports. Fully finished English dovetailed drawer boxes with ball bearing side glides. Hardware is an industrial bar pull with square back plates with a brushed nickel color finish.